The remains of a medieval knight have been discovered underneath a car park that is being demolished at a city-centre building site. 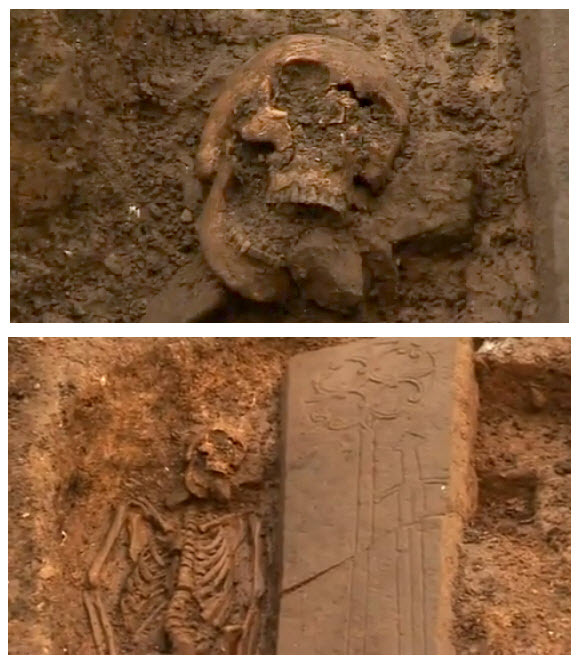 The skeleton was found in Edinburgh’s Old Town after archaeologists uncovered the corner of an elaborately decorated sandstone slab bearing markings of a member of the nobility – the carvings of the Calvary Cross and an ornate sword. An excavation of the immediate area uncovered the adult skeleton, which archaeologists said is likely to have once occupied the nearby grave. The discovery is being hailed as having the potential to be “one of the most significant and exciting archaeological discoveries in the city for years”. The find comes just a month after a skeleton unearthed in a car park in Leicester was confirmed as being that of the English king Richard III, who was killed in battle in 1485. Experts from the University of Leicester said DNA from the bones matched that of descendants from the monarch’s family. 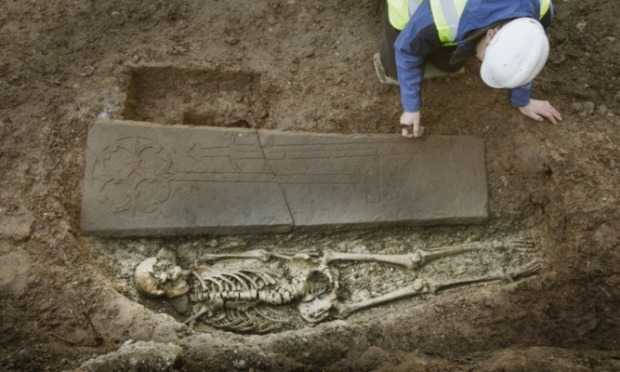 The latest skeleton find and grave, as well as the remains of a 13th-century monastery, were unearthed at High School Yards, off South Bridge, as the former car park was being cleared to make way for the construction of the University of Edinburgh’s new Edinburgh Centre for Carbon Innovation (ECCI). An analysis of the knight’s skeleton and teeth will be carried out to determine where he was born, what he ate, where he had been living and to work out what caused his death. The knight’s remains have also revealed the exact location of Blackfriars Monastery, which was founded in 1230 by Alexander II – king of Scotland from 1214 to 1249 – before it was destroyed during the Reformation. Ross Murray, the archaeologist who found the grave, studied at the university’s former archaeology building, which until 2010 was located at High School Yards, just a few feet from where the knight’s grave was discovered. He said: “We knew the history of the High School Yards site while we were studying here, but I never imagined I would be back here to make such an incredible discovery. Mr Murray is working as part of a team for Edinburgh-based Headland Archaeology, which is carrying out archaeological services for the project. The excavation also revealed several more human burials, including children, with the bodies lying in an east-west location, which is typical of Christian burials. The burial sites will be fully excavated and remains will be removed from the site before being re-interred at an appropriate location. Richard Lewis, culture convener at Edinburgh City Council, said that the council is aiming to preserve the remains of the monastery and the 16th-century high school in situ due to their potential national significance as excavation would lead to their complete destruction. “We hope to find out more about the person buried in the tomb once we remove the headstone, but our archaeologists have already dated the gravestone to the 13th century. High School Yards has always been a significant architectural site and as well as the monastery it has housed two further significant buildings – the 16th-century Royal High School and the 18th-century Old High School.